What you see here is everything you need to enjoy absinthe in the traditional manner: fine absinthe, a glass, an absinthe spoon, sugar, and a carafe full of ice-cold water. Note: Under no circumstances should fire have any part in absinthe preparation. This is a pointless innovation created in the late 1990's and promoted by the purveyors of imitation absinthe to make their products seem more interesting and to reinforce the illicit drug image. Likewise, absinthe being in the 106 - 148 proof range, it is not intended to be drunk neat or in shots, but should be tempered with water, making it about the strength of a glass of wine. 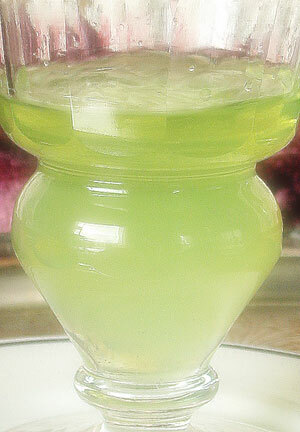 Absinthe was drunk as a light aperitif. The spoon is perhaps the most unique bit of absinthe paraphernalia. It consists of a flat, perforated trowel-like tool with a small indented area in the handle to hold it in place on the edge of the glass. 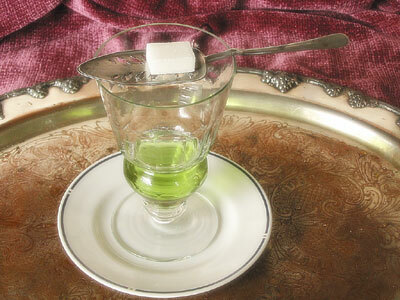 The perforations allow the water and melting sugar to pass into the glass of absinthe below. 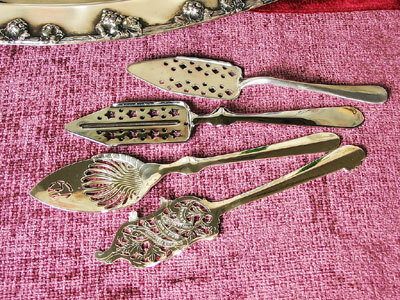 During the late 1800s, hundreds of different styles were made, some of which are seen here. There are several nice reproductions available today at reasonable prices. If you do not have a proper absinthe spoon yet, a common fork will do. As with coffee or tea, whether to use sugar is entirely a matter of individual taste. Sugar cubes are not as commonly used in the US today, but are fortunately still available in most places. Some sugar cubes are rather small and you may choose to use two. Or, if you prefer, you may choose not to use it at all. 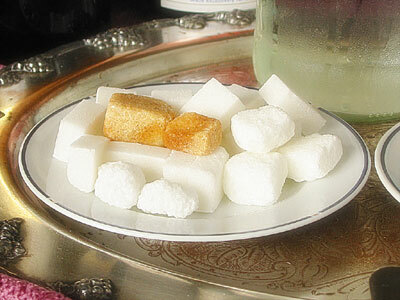 Gourmet sugar cubes are available in both refined and raw varieties, as shown, but tend to take longer to dissolve. The earliest absinthe glasses were ordinary water glasses of the type in which water, wine, lemonade or iced tea were served in bistros. 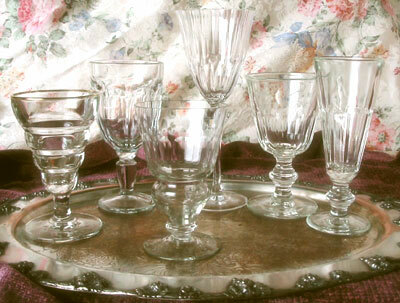 Later, glasses were made with reservoirs or markings which helped the servers pour the correct amount of absinthe. A wine glass will suffice, beautifully. Most kitchen supply stores stock glasses which are appropriate. 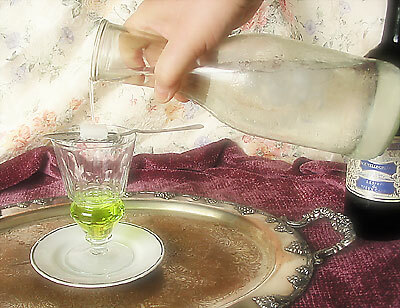 Start by pouring one ounce of absinthe into the glass. Place the spoon across the rim of the glass, with the notch of the spoon resting on the rim and place a sugar cube upon the spoon. If you are using a carafe, begin by pouring a small amount of water onto the sugar, saturating it. Allow it to sit for a minute or two so that the sugar begins to loosen and dissolve on its own. Then begin slowly drizzling a very slender stream of water onto the sugar cube. You may want to practice for a while in an empty glass to develop a pouring technique that suits your carafe or pitcher. The customary ratio suggested by historical absinthe labels was five ounces of water to one ounce of absinthe, making a six-ounce drink at around twelve to fourteen percent alcohol by volume, similar to a glass of light wine. Since absinthe comes in a variety of proofs, some will require more water than others; you can use the calculator below to assist in pouring drinks of approximately the same strength. 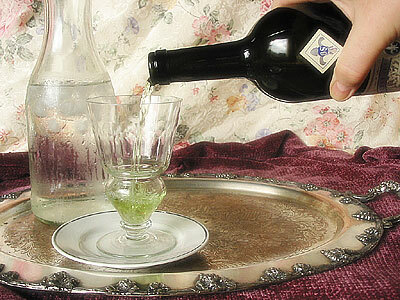 With experience, you will determine the best absinthe-to-water ratio for your taste. add ounce(s) of ice-cold water. Also, there are fountains made especially for absinthe which can be used to drip the water slowly. As you add water, watch closely as it mixes with the absinthe. When the water-to-absinthe ratio reaches a certain level, the essential oils which are dissolved in the absinthe during distillation will emulsify with the water and create the marvelous, opalescent, cloudy effect known as the "louche." 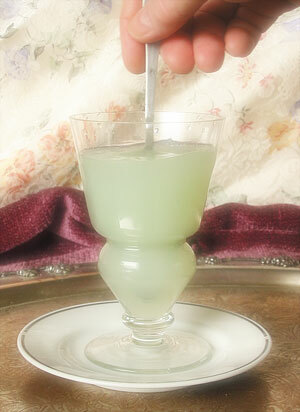 A proper louche is among the characteristics used to evaluate a premium absinthe. It should be neither too thick nor too thin, indicating either too much or not enough anise. 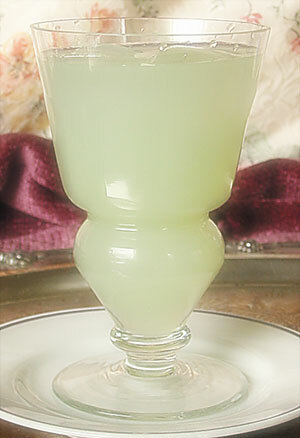 Absinthe is above all, an anise drink, but it should not be overpowering and candy-like. 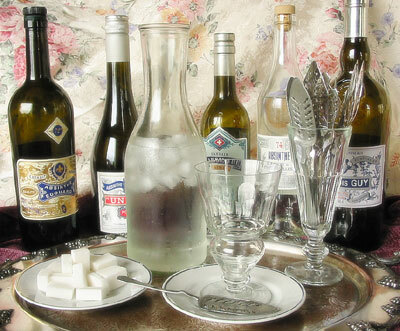 Some imitation absinthes—containing no anise—use gums and resins to obtain a louche. This was a hallmark of an improperly made absinthe in the 19th century. A good louche should be opalescent and translucent in good light, neither transparent nor opaque. It is best observed in full sunlight, and is appreciated even more with the second glass! As the glass slowly fills and the louche develops, the bouquet of the absinthe is more fully released and you may detect fragrance notes which were only barely perceptible in the undiluted absinthe. Continue slowly pouring until the sugar cube is completely dissolved. Stir any remaining, undissolved sugar in the bottom of the glass. You may want to leave room for a couple ice cubes. If you choose to use ice, you should take that into account when deciding how strong to pour your drink as the melting ice will dilute the drink further. Now, sit back and sip your absinthe slowly. While anise and fennel are usually the predominant flavor and aroma in absinthe, and some of the finest absinthes use only six herbs, there can be a number of other herbs used, many of which are easily discernable while others are more subtle and elusive. Roll the absinthe around in your mouth and pay close attention to the flavors and sensations on various part of your mouth and tongue. Enjoy! The Green Hour is at hand! Shake with ice. Strain into cocktail glass. Add 1 pearl onion.